Fashions mark the decades and era throughout history. Hard work and dressing the correct socially accepted way was the life for women in America or other locations. 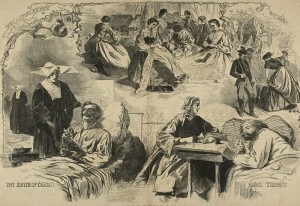 It is interesting during this 150th anniversary of the American Civil War that you reflect and look closer at an era before and during the Civil War when life was very difficult for women. They worked, but could not vote, have bank accounts or directly have control of a business. Many women did have to operate a store or other business with so many men off to war. In spite of hardships of war, deaths in the family, the women carried on — while wearing some very unusual and somewhat restricting fashions. 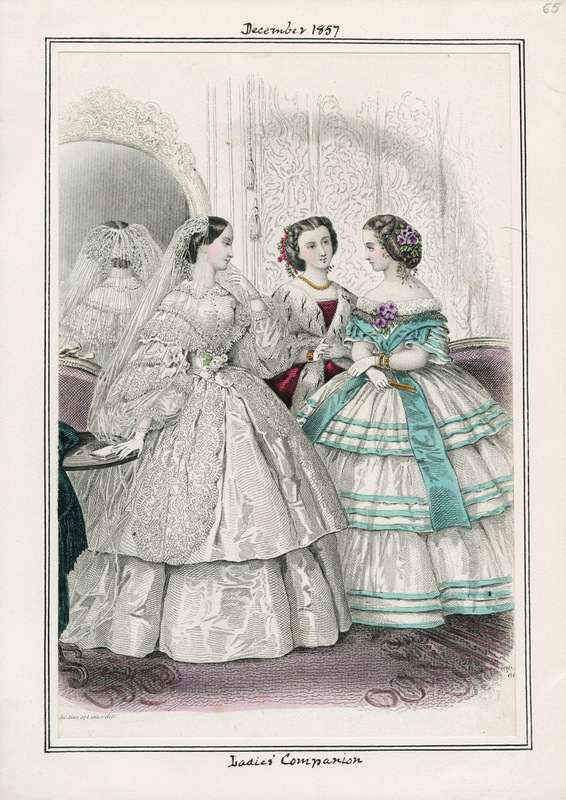 For example, an acceptable, outside the home dress would be made of a silk plain weave (taffeta), trimmed with silk fringe tassels, machine embroidered net, and bobbin lace. Underneath would layers of undergarments, very restricting. The female silhouette in the middle of the 19th century consisted of a fitted corseted bodice and wide full skirts. The conical skirts developed between the 1830s, when the high waist of the Empire silhouette was lowered and the skirts became more bell shaped, to the late 1860s, when the fullness of the skirts were pulled to the back and the bustle developed. The very flared skirts of that period gradually increased in size throughout and were supported by a number of methods. Originally support came from multiple layers of petticoats which, due to weight and discomfort, were supplanted by underskirts comprised of graduated hoops made from materials such as baleen, cane and metal. 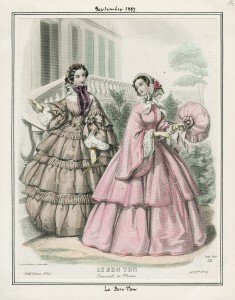 The fashions during this time allowed the textiles to stand out because of the vast surface areas of the skirt and a relatively minimal amount of excess trim. In spite of of all this fabric, they did manage to run a household, tend to a farm, or what other worked was required. 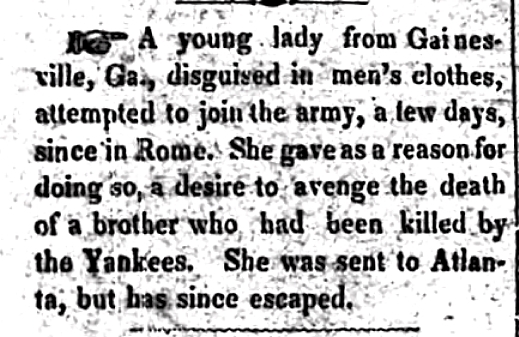 One place where a few broke with that traditional clothing were the women who tried to be a direct part of the war effort by pretending to be a man and joining the either the Union or Confederacy Armies. Some 250 women joined as ‘men’ the Confederacy Army a greater number than 300 joined the Federal Union Army. They not only had to dress like a male / solider, but behave like one. That may have been the hardest part. The reasons for joining could range from patriotism for the cause; keeping watch over a husband, boyfriend, or brother; a method to earn money for the family or just an opportunity for adventure. 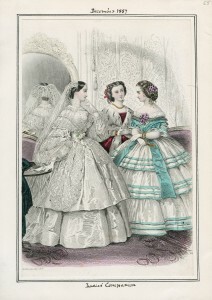 Fashions would continue to change, many times just as restrictive in the 1890s and early 1900s as they had in the 1850s-1860s. This small review offers you a little insight of how your great great grandmother and other female ancestors lived. Attempts at joining the Army. 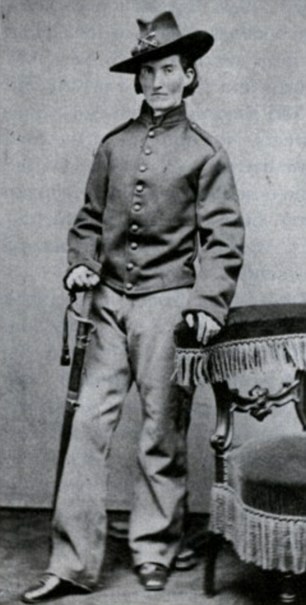 Union female soldier serving for Missouri — known as Jack Williams (real name Frances Clayton). Women at work in all levels (source – Harpers Weekly Sept. 1864).